I worked at LinkedIn as an UX Design intern in Summer 2018. Collaborated closely with PM, researcher and engineers, I redesigned the Profile to better represent people with client-based work, impacting 1M freelancers and 2.5 M self-employed workers. I was responsible for the project from end to end, and crafted the View and Edit experiences for IOS, desktop & mobile web. LinkedIn users who engaged in client-based work, such as freelancers and contractors, struggle to represent their experiences on their profiles. 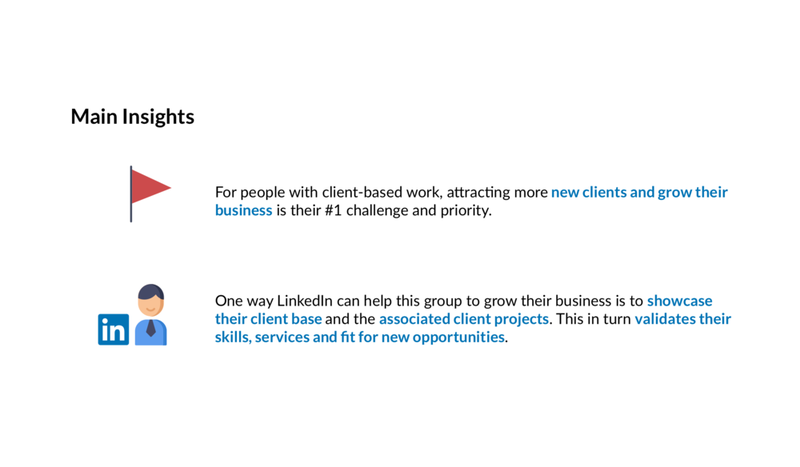 Help people to represent their client-based work on LinkedIn and attract new opportunities by highlighting their past clients and validating their expertise. Crafted the Edit flow for users to convert their existing experiences to clients or add a new client to their LinkedIn Profiles. According to Forbes, there are 57.3 million people who engage in client-based work, such as freelancers and contractors, making up to 36% of the U.S. workforce. The current LinkedIn Profile is designed to be a template for traditional corporate experiences. As a result, LinkedIn users who engaged in client-based work struggle to represent their experiences on their profiles. I studied 20+ profiles with client experiences to better understand the problem. Create a new page to further showcase specific projects & services in a visually attracting way. Such strategy was decided because not all users are able show their projects in detail (e.g. under NDA), so we want to provide a baseline functionality to highlight clients on the top level of profile. This strategy is also made based on engineering and time constrains as there is a balance of adding to existing profile and creating an entirely new page. I made some key design decisions based on the research results and user testing session in accordance to the product strategy. Question 1: How should the information and its hierarchy change for clients? Decision 1: Prioritize client’s name, and allow users to state the service they provided on profile top level. According to the survey result, client’s name and brand are critical to show, so I prioritized the client’s name instead of job title for the redesign. After the user testing session, I decided to surface the “service provided” for the redesign to help highlight and validate user’s skills. Question 2: How to feature the most valuable clients? Decision 2: Give users the ability to reorder their clients. The request to be able to reorder clients came up many times during interviews. Reorder functionality has been something that LinkedIn users asked for a long time, as current profile list everything chronologically. However, there are some reasons against such functionality, such as recruiter prefer to read profile in chronological order. In the redesign, I discussed with my PM & engineers about the importance of the Reordering and technology constraints by using research data. At the end, I was able to include such new functionality to help achieve user goal in my redesign. I explored how to showcase clients on the profile top level to hit the user value points and tested them during the internal testing sessions to decide on a final one. For example, although exploration 2 shows the same information as final decision, and seems to save vertical space, for users who have only one freelance experience but with many clients, their profile will look quite empty after the redesign. Question 4: How to let users easily add new clients, or change their existing experiences listed on Profile to clients? Decision 4: Within the existing “Edit experience” mode, add a new “Client” section. This section allows users to either add an entirely new client, or choose existing experiences on their profile to convert to clients. There are two use cases when users want to add clients: 1) add an entirely new client 2) choose existing experiences on profile and convert those to clients. I explored multiple different edit flows that support these 2 use cases both within the current “Edit experience” mode, or directly from the top level on LinkedIn profile. Since most users have already listed clients on their profile, the use case of 2nd use case will be much more dominant initially. Therefore, I want to make sure the edit flow enables easily converting multiple experiences that are already on user’s profile. The new design creates clear visual hierarchy that differentiate client experiences from corporate experiences, and allows users to showcase the quality and quantity of their clients as well as their service on profile top level. Incorporate a client section on existing LinkedIn profile ecosystem. Clients now appear as a subsection under different experiences. A dedicated project page for people to list the services that they provide, and showcase past projects in a visually attracting way.